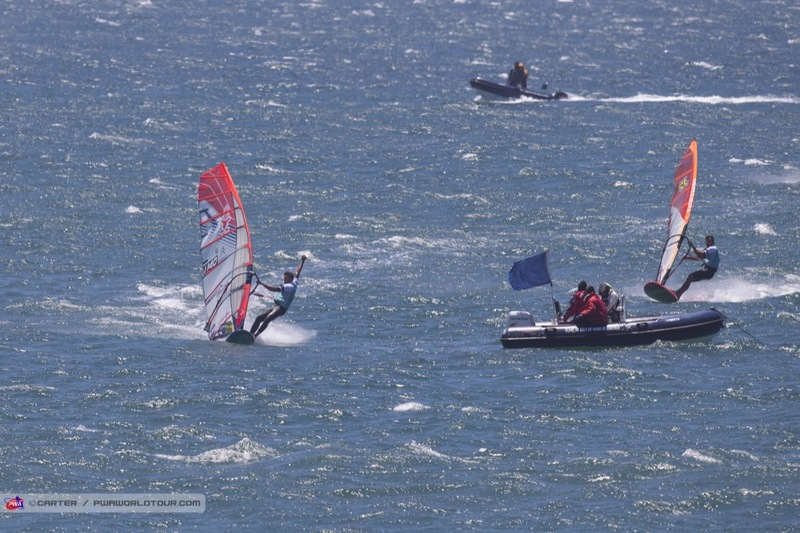 Viana do Castelo continues to enhance its reputation as one of Portugal’s, and Europe’s, windiest locations as the wind continued to howl on Day 3 of the 2018 Viana PWA World Cup. With winds reaching in excess of 40-knots for the second consecutive day the slalom fleets were once again left reaching for their smallest equipment as conditions turned into survival of the fittest - or bravest - at times such was the ferociousness of the wind. Delphine Cousin Questel (Starboard / S2Maui) remains at the top of the current event rankings after a solid day of racing. The 26-year-old has seen her overnight lead reduced to 2.3 points after finishing 2nd behind Sarah-Quita Offringa (Starboard / NeilPryde / Maui Ultra Fins) in Elimination 3, before having to settle for 3rd place in Elimination 4. Cousin Questel led for the entire race but dropped her final gybe in the extreme conditions to drop a couple of places. As mentioned Offringa secured her first bullet of the event - and season - in Elimination 3 as she continued to improve her result in every elimination up to that point, but then struggled slightly as the wind reached in excess of 40 knots. The Aruban instantly discards a 5th place from Elimination 4 and will now return her focus to the freestyle ready for tomorrow. Meanwhile, Lena Erdil (Starboard / Point-7 / AL360 / Chopper Fins) cemented her overnight ranking in 3rd after recording the same results as on Day 2 with a 2nd and a 4th. Erdil didn’t always time her starts the best, but she used her blistering straight-line speed to blitz her rivals when needed. Maëlle Guilbaud (Patrik / Loftsails) remains in 4th place after a 3rd and 8th today, but now has Marion Mortefon (Fanatic / NorthSails) just 1.7 points behind her after the 26-year-old produced an excellent response to yesterday’s slightly disappointing set of results (7th and 11th). Firstly, Mortefon did brilliantly to recover into 5th place in Elimination 3 after being blocked by a falling Jenna Gibson (Fanatic / NorthSails) at the first buoy and then the current World No.3 was on hand to overtake Cousin Questel at the last to earn her first bullet of the season. Victory in Elimination 4 puts Mortefon firmly back in control of the battle for the overall podium between herself and Guilbaud. Elsewhere, Esther de Geus (Fanatic / NorthSails) continues to perform extremely consistently after two 6th places on Day 3, but she slips one place to 6th after Mortefon’s come back, while Lilou Granier (Starboard / Severne) is a place further back in 7th after she followed up a premature start in the semifinals of Elimination 3 with her best result of the event yet in the next race - 4th. The PWA would also like to wish Alice Liittaye a speedy recovery after the 19-year-old suffered a broken finger while warming up and required surgery. In the Men’s Slalom, Cedric Bordes’ (Tabou / GA Sails) lead at the top of the event rankings was short-lived with current world tour leader - Matteo Iachino (Starboard / Severne / Shamal Sunglasses) - registering his first bullet of the week in Elimination 3 to take control at the top of the current event rankings, while Bordes suffered a shock quarterfinal exit, and then missed out on the Winners’ Final in Elimination 4 to slip two places to 3rd. Iachino’s closest rival at the close of Day 3 is a familiar face with reigning world champion Antoine Albeau (RRD / NeilPryde) enjoying an excellent day to rise into 2nd place and trails the Italian by just 1.7 points. It looks like there is another epic battle developing between the two heavyweights. Albeau and Iachino went head-to-head in the Winners’ Final of Elimination 4, but Albeau just held off a scintillating final reach comeback by Iachino to secure his second bullet of the event to leave the event title race wide open. Iachino is showing unbelievable consistency at the moment though with a 3rd, 1st and a 2nd from his last 3 races. Pierre Mortefon (Fanatic / NorthSails / Chopper Fins) rises two-places from the overnight rankings to 4th after the Frenchman bounced back from a disappointing quarterfinal final exit in Elimination 3 with a solid 5th place in Elimination 4. Ben van der Steen (I-99 / Gun Sails) remains in 5th after qualifying for his second Winners’ Final of the week in the third elimination, but things could’ve been even better for VDS if he had not crashed in Elimination 4, Heat 10 when in the qualifying positions. However, van der Steen remains in the hunt for the podium at the end of the second day of racing. Pascal Toselli (JP / NeilPryde), who injured his shoulder slightly after a fall while training 2 days ago looked to be back to his dangerous best today as the Frenchman, who is currently 3rd overall in the world rankings, bounced back by qualifying for both Winners’ Finals where he recorded 2nd and 7th place finishes respectively, which sees him rise to 6th at the close of play on Day 3 and only 4.3 points off of 3rd place. The same is also true of Jordy Vonk (Fanatic / NorthSails). Yesterday’s Birthday boy endured a bit of a day to forget after quarter and then semifinal exits on Day 2, but he returned to his best today as he finished 4th and 5th to rise to 7th. The 25-year-old showed his usual blistering speed, but it was his gybing that caught the eye today as he produced a couple of outstanding gybes, at crucial times, to jump into the qualification places and allow him to advance into the finals. Vonk is now firmly back on track for a 4th consecutive top 10 finish. Finian Maynard (I-99) also moves into the top 10 after a 3rd and 15th place, but maybe slightly a little disappointed after missing out on his third consecutive Winners’ Final of the event when dropping a gybe while 4th in the semifinals. Meanwhile, Tristan Algret (Starboard / Severne / Chopper Fins), remains in the top 10 - 9th - but didn’t enjoy as good of a day as yesterday, while Marco Lang (Fanatic / NorthSails) completes the top 10. The Austrian earned his best finish of the season in Elimination 3 - 4th - but was then eliminated during the quarterfinals of the next race. This time yesterday Arnon Dagan (RRD / NeilPryde) found himself ranked 30th, but at the end of today, he climbs all the way to 12th after enjoying an excellent day. The Israeli was confident in his pace yesterday, but things didn’t quite click for him, however today was a different story and he walks away with an 8th and a 3rd place to put himself back in contention for the top 10. Ross Williams (Tabou / GA Sails / Shamal Sunglasses) experienced a tough start to the event, which saw the Brit fail to get past the quarterfinals in the opening 3 races. However, the Brit showed plenty of grit and determination in Elimination 4 to book his spot in the Winners’ Final where he earned 6th. Elsewhere, 19-year-old Basile Jacquin (RRD / Point-7) claimed his second top 10 finish of the event in Elimination 4 - 10th - to keep himself in the top 16, while Taty Frans (Starboard / GA Sails / Shamal Sunglasses) earned his second-best finish in an elimination since returning from injury after finishing 3rd in the b-final of Elimination 4. However, that almost came at a price as the Bonairean was sent flying as he crossed the finish line after either sailing into the buoy or catching the rope. Thankfully he was fine. The opening 8 heats of Elimination 5 were also completed, but unfortunately, Croatia’s Enrico Marotti (JP / NeilPryde) suffered an injury during Heat 7. The seriousness of which is not yet known, but it appears to be either a foot or ankle injury. Everyone from the PWA would like to wish Enrico a speedy recovery. During the earlier 7 heats of Elimination 5 it almost became a survival battle and if you were able to stay on your board you had a good chance of qualifying. Martin Møller Hovda (Starboard / Severne) was leading Heat 6 heading down the final reach, but ended up missing out after catapulting as he approached the line allowing Marco Lang (Fanatic / NorthSails), Nicolas Goyard (Tabou / GA Sails), Benjamin Augé (Patrik / Sailloft Hamburg) and Ramon Pastor (I-99 / Loftsails) to all overtake. According to the locals, the wind could get even stronger tomorrow, so with that in mind the decision has been made to call an earlier skippers’ meeting for the Women’s Freestyle fleet - 9:30am with a first possible start at 10am (GMT+1) while the Slalom fleet will have their skippers’ meeting at 12pm - first possible start 12:30pm.